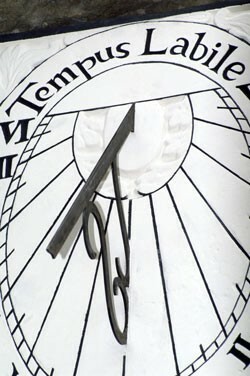 On the 18th May 2006, the restored Bishopthorpe sundial was officially ‘unveiled’. 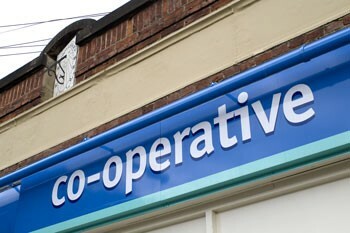 To be accurate, the explanatory plaque fixed to the shop wall was unveiled instead – as no one could be persuaded to shin up onto the Co-op roof! 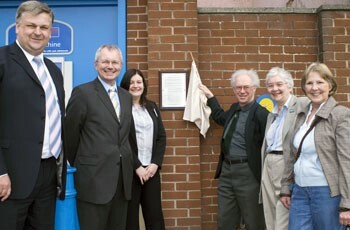 Shown here are, from left to right: John Briddon, Co-op Senior Operations Manager; Stewart Harrison, Chair Bishopthorpe Parish Council; Tessa Chesworth, Manager Bishopthorpe Co-op; Michael Mathieson, Co-op; Linda Haywood, Bishopthorpe Local History Group and Brenda Lees, retired Co-op assistant. Many well-wishers attended the unveiling ceremony – and some even stayed to have their photograph taken! 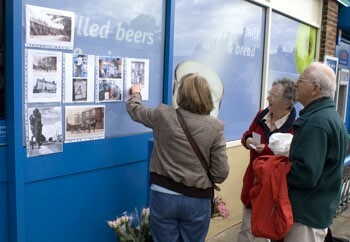 Brenda Lees and Brian and Diana Forrester look at the historic photographs displayed outside the Co-op. Brenda retired from the Bishopthorpe Co-op in 2000 after thirty years working there as a shop assistant. 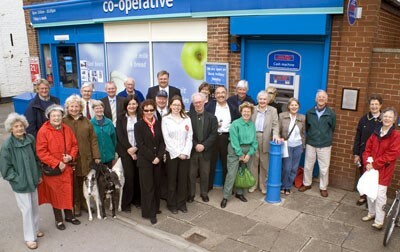 With many thanks to United Co-operatives for the photographs – and for restoring the sundial.